After a long proclaimed the emergence of the sixth generation. Finally, Volkswagen also has authorized new car market products. The products named T6 Transporter is still carrying a distinctive body design that is the shape of a box. As for the renewal of the outside look like the front and rear lights use LED technology. And to add to the impression of a modern look, T6 was also equipped with 16-inch rims following plus disk disc. In order to add comfort while driving. 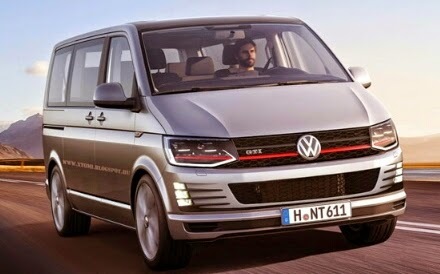 T6 also has applied the heating system on the glass, which has an electronic trunk door, front sensors, Adaptive Cruise Control, and Dynamic Cruise Control. for the latter feature is present in the three driving modes, namely a comfortable, normal, and sport. As for business machines, Volkswagen has set up various types of engine options as needed. As EA288 diesel engine capacity of 2,000 cc Nutz present ranging from powerful 83 horsepower (101, 148 and 201 horsepower). And in addition there is also to a gasoline engine of 2,000 cc resulted in a force capable of 148 and 201 horsepower. As for the price of VW T6 is on offer there are two types of options. For commercial type in the given price EUR23.035 or about Rp319 million, while for the type Multivan in selling much more expensive at or about Rp415 million EUR29.952.